Nicholas Soprano is 76 years of age with a past history of cardiac failure, Stage 2 (moderate) renal impairment, hypertension, an AMI in 2004 and Gastro Esophageal Reflux Disease (GORD). 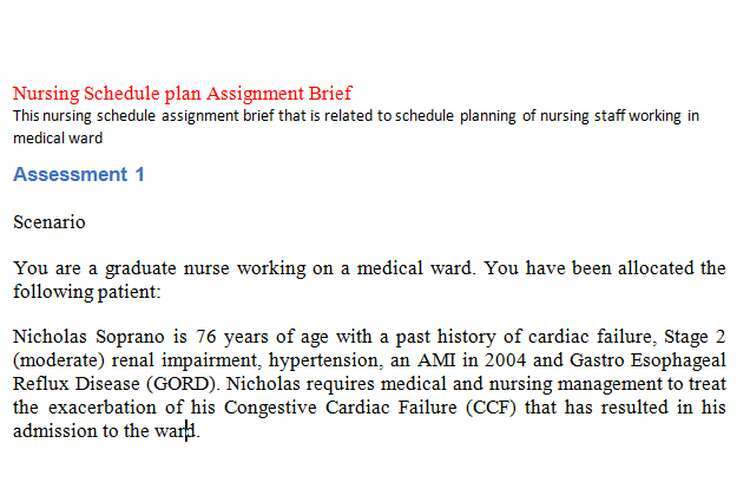 Nicholas requires medical and nursing practices management to treat the exacerbation of his Congestive Cardiac Failure (CCF) that has resulted in his admission to the ward. In the past 2 weeks Nicholas has gained 3kg, has suffered from increased shortness of breath on exertion (SOBOE) and has increased peripheral edema with pitting edema to his calves. On auscultation his chest has crackles in the bases and Nicholas requires 40% humidified oxygen via high flow nasal canola. Nicholas has an IVC inset in his right hand, which was inserted 2 days ago; the IVC has not been used. Nicholas has been placed on a 1.2L fluid restriction per day and he is on a strict Fluid Balance Chart. You are required to develop a nursing shift plan for yourself that addresses the care you will provide throughout a shift from 0700-1530. The plan must address Nicholas’s needs and be care that you are able to provide for him (that is nursing in nature). In developing your nursing care plan you are required to provide rationales that are supported by evidence that support the care you are proposing for Nicholas. The assessment does not require an introduction or conclusion but must have in-text citations and a comprehensive reference list using APA. The content provided must be structured in paragraphs with no bullet points. Students are encouraged to use the following format for their assessment. Please read the rubric set up for this assessment takes carefully. These are the criteria that you will be assessed against for this task. It is important that you read and understand the rubric before you attempt to write your assessment. Understanding the criteria written in this rubric will help you clarify what we are looking for in this presentation. The rubric for this task can be viewed in the Assessment 1 Drop box where you can also submit your work and in the back of the unit outline.